Soup is a constant. From slurping French onion soup at Gatwick as a child to being blown away by the sour spicy hit of Tom Yam on my first trip East, soup appears all over the world. It must answer a deep seated need for nourishment and warmth that goes beyond simple degrees celsius. Sometimes, particularly when I’m under the weather, I crave a clear meaty broth, simple chicken and ginger or a more complex Pho – which many consider to be the ultimate soup. Clean, crisp and subtle flavour. Other times, when it’s cold and I’m hungry, I need a soup with substance. Something that will slide thickly over the tongue, smooth and soothing and full of taste. Which is where this heavy-duty warm and spicy number comes in. Its roots (no pun intended) are in the “dustbin soup” we would eat when I was growing up. The sort where left over veg was thrown in a pot along with vegetables found hanging around in the fridge. It was so satisfying, particularly with some thick crusty bread and strong cheddar. 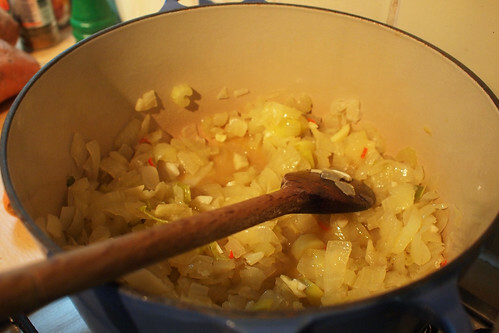 Here, I’ve used vegetables with a sweet edge – one of those huge Spanish onions, leeks, carrots, sweet potato. Sweat those in some butter and you could almost have a dessert. Instead I’ve emphasised their warm flavours and mitigated the sweetness with some spice. You wouldn’t want to play around with fresh herbs here, they’d be overwhelmed. You want something warm and powerful to balance the strong sugars. This is why I’ve gone with turmeric to bring the flavour down to earth a little, and lend it more colour, and gram masala to add aroma, gentle warmth and deep spicy notes. If you’re after a more intensely savoury-sweet soup then you could roast the carrots and sweet potato first. But I find this a bit too much. Or you could add a potato and some cream to give it a super smooth texture. But for me, like Ol’ Blue Eyes, that’s a little too slick. What I like to do is to finish it off with some tangy and thick Greek yoghurt. Add a little sour edge, something to cut the sweet and spice. Like all soups this is very flexible. The only constant is the onion, sweet potato (or pumpkin/butternut squash) and stock. The key is to use the best possible stock. I like home made chicken stock for the rich, deep but not overwhelmingly meaty flavour. But I have also used vegetable stock and the result has been pretty damn good. With these quantities you don’t have to be too careful with the spices, otherwise they’ll be so subtle as to be non-existent. I think a korma curry mix would go well here in stead of the gram masala, also ras al hanout – the Moroccan blend – would work very well. Or you can have no spice at all, I just like the aromatic and warming edge it gives. Heat oil in a large pan over a low heat and sweat the onions for about 30 mins with the lid on. Chuck in the ginger, garlic and chilli, stir a couple of times, add the leaks and celery and heat for another 15 minutes with the lid on. Now throw in the spices. Stir and cook for a minute or so. Add the sweet potato and carrot, stir well and pour in the stock. 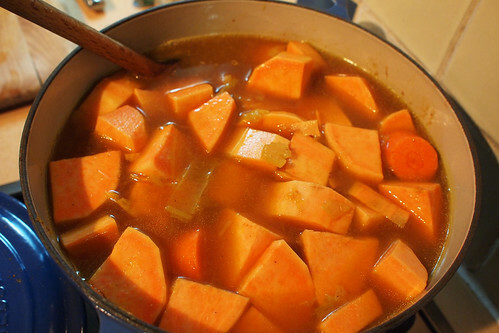 Bring to a simmer over a medium heat and let it bubble away for 20 minutes or so, until the sweet potato and carrot are tender. Remove from the heat and blend (I use a handheld one). Stir in the umami paste and add more stock or water until you have the desired liquidity, i like my soups thick and viscous. Reheat when ready to eat, maybe add a dollop of Greek yoghurt and some black pepper. @Vintage Macaroon – i just used loads of sweet potato and carrot. My method is to only just cover the veg in stock for cooking, then blend it to a light puree, then add stock as I blend to get the desired consistency. @S – You never sound uncouth I like the sound of a chapati, or a pile of freshly cooked rotis to roll up and dip in! Yum. Humm! You could also add fresh ginger – lots to give it a wonderful warmth and spice. And your tip for making it really thick is a good one. Had a soup at a cafe yesterday and it was thin-thin, not nice! !